WASHINGTON (CNN) -- It isn't clear whether the United States will ever be able to declare victory in Iraq, the top U.S. commander there said Thursday. 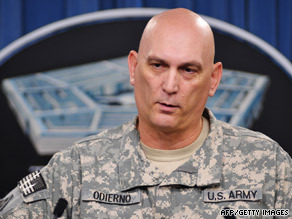 Army Gen. Ray Odierno speaks to reporters at the Pentagon on Thursday. "I'm not sure we will ever see anyone declare victory in Iraq, because first off, I'm not sure we'll know for 10 years or five years," Army Gen. Ray Odierno told reporters at the Pentagon. About 123,000 U.S. troops are in Iraq now, and President Obama says all combat forces will be gone by the end of August 2010, leaving as many as 50,000 noncombat troops to advise and train Iraqi forces before leaving by the end of 2011. Odierno has said he wants to draw down the U.S. forces at a faster rate than planned if the security situation allows it. On Thursday, he said he expected the number of U.S. troops to drop to 120,000 by the end of October, and to as few as 110,000 by the end of 2009. "What we've done here is we're giving Iraq an opportunity in the long term to be a strategic partner of the United States, but more importantly, be a partner in providing regional stability inside of the Middle East," Odierno said. Odierno also highlighted continuing security issues inside the country, saying Iraqi security forces have recently seized several "very large" caches of Iranian-made rockets and armor-piercing munitions known as explosively formed penetrators, or EFPs. "If you're training people ... in Iran to come back into Iraq, and you're providing them rockets and other things, I call that significant because it still enables people to conduct attacks not only on U.S. forces but on Iraqi civilians," Odierno said. At a congressional hearing Wednesday, Odierno said the main threat to stability in Iraq are Arab-Kurd tensions, adding there has been difficulty bringing the two sides together for possible joint patrols. "We've had some very good meetings," he said. "But we still have some ways to go on that."